sheet opportunity (of the kind that Buell and MV Agusta would have eventually represented) says much about the realities of the Milwaukee balance sheet. Just as its once take-over target Ducati has been swallowed up by VAG (Volkswagen Audi Group), and at a time when MV Agusta are vehemently denying rumors of a courtship by GM, and at a time when both EBR and KTM (another company that once came within a nano-second of becoming a part of Harley's balance sheet) are pretty much half owned by Indian manufacturers, and Chinese manufacturers are poised to 'hoover-up' so-called 'Heritage' brands of all kinds whenever they come on the block, rumors about Harley-Davidson's vulnerability to big equity or automotive avarice remain persistent; they just won't go away. With the kind of capital required to truly embrace other areas of the motorcycle industry (either through acquisition or through engineering) appearing to be beyond present finances, and be something far from the mind of existing stock holders, then they are vulnerable. There is always a bigger fish, and even though we are barely out of recession yet, M&A activity is heading for near epidemic proportions as fund managers thrash about in a frenzy of portfolio gap-filling while there are still tasty treats to be had. As bait goes, Harley-Davidson is a juicy worm. It is pretty much debt-free (in ratio terms at any rate), it is pretty much self-contained, and is pretty much an ATM waiting for a PIN code. As a start point for an investment portfolio, or as an addition to an established fund, Harley has "buy me" stamped all over it, especially if another marque or emerging brand from elsewhere in the riding landscape could be stabled with it. In contrast to Harley's paralysis in such matters, look at the activity over at their Midwestern nemesis - Polaris. It was always a matter of record that there was concern enough about their progress with Victory, but the’ sang froid’ coming out of Milwaukee when Polaris acquired the Indian Motorcycles operation from Stephen Julius (Stellican) has fooled nobody. With Polaris making plays in the electric and utility/delivery vehicle markets, and beefing up their PG&A income streams (that always lucrative driver of stakeholder dividends as Harley themselves know only too well), investors with an eye for return timescales could see the opportunity to 'off' their stock without having to get their funds dirty by actually having to do anything as tawdry as actually compete with powerful adversaries could be tempted to head for the exits as soon as the share price triggers someone’s algorithm. Without the ability to undertake strategic strengthening as a result of a friendly deal, Harley will remain vulnerable to being bled by the leaches. <<< Continued from cover six times as many to African Americans and more than seven times as many to Hispanics, as the nearest competitor." According to Harley-Davidson's internal data, retail sales of its motorcycles to U.S. "outreach" customers grew at more than twice the rate of sales growth to core customers in 2013 compared to 2012. First-quarter 2014 diluted earnings per share were $1.21 (up 22.2%) on "higher motorcycle shipments and continued i m p r o v e me n t i n o p e ra t i n g efficiencies." First-quarter net income was $265.9 million ($224.1 m in Q1 2013) on consolidated revenue of $1.73 billion ($1.57 billion in Q1 2013). "Harley-Davidson delivered gains on many fronts in the first quarter, with shipments up 7.3%, strong margin improvement and solid growth in dealer new motorcycle sales," said Wandell. " O u r P r o j e c t RU S H M O R E motorcycles were in high demand in the quarter and we began shipping the Harley-Davidson Street 750 and 500 into select markets." First-quarter operating income from motorcycles and related products grew 25.6% to $347.7 million ($276.8 m in Q1 2013); operating income in the quarter "benefited from higher motorcycle shipments and higher gross margin compared to the prior-year period", according to the Company. Revenue from motorcycles grew 13.1% to $1.31 billion ($1.15 billion in Q1 2013) - the Company says it shipped 80,682 motorcycles to dealers and distributors worldwide during the quarter, which it says was "in line with guidance and a 7.3% increase compared to shipments of 75,222 motorcycles in the year-ago period." Revenue from motorcycle parts and accessories was $198.1 million during the quarter, up 7.7%, and revenue from general merchandise, which includes MotorClothes apparel and accessories, was $64.1 million, down 11.1%, compared to the yearago period. Gross margin was 37.7% in the first quarter of 2014, compared to 36.7% in the first quarter of 2013. First-quarter operating margin from motorcycles and related products was 22.1%, compared to operating margin of 19.6% in last year's first quarter. Operating income from financial services was $63.2 million in the first quarter of 2014, an 11.7% decrease compared to operating income of $71.5 million in last year's first quarter - Harley says that "firstquarter financial services results reflect a higher provision for credit losses." Harley-Davidson continues to expect to ship 279,000 to 284,000 motorcycles to dealers and distributors worldwide in 2014, an approximate 7% to 9% increase from 2013. 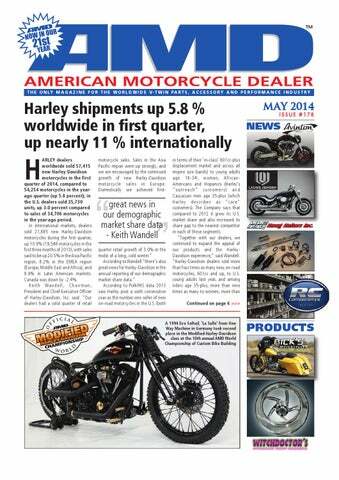 In the second quarter of 2014, the Company expects to ship 92,000 to 97,000 motorcycles, up from shipments of 84,606 motorcycles in the year-ago period. The Company continues to expect full-year 2014 operating margin of 17.5% to 18.5% in the Motorcycles segment. The Company also continues to expect capital expenditures of $215 million to $235 million in 2014. New designs offered by Renegade CALIFORNIAN custom wheel specialist Renegade Wheels has brought new wheel designs to market for 2014, which includes the Renegade Bridgeport. This new design is offered in diameters from 16in up to 30in, and a choice of Phantom-Cut, chrome, or black powder-coated finishes. Manufactured from forged aluminum billet, which is CNC- machined, the Bridgeport wheel, which has 14 interlaced spokes, can be combined with matching rotors, sprockets, pulleys, derby covers and air cleaners. Jim Winn "we are starting to see some upturn in the market" motorcycle builders/dealers we can develop an approach that leverages local market expertise and provide those businesses with access to a build program that has greater pedigree and design/engineering foundations than any single custom shop or builder could create. problems resulting in failed batteries and non-functioning scooters resulted in Gold Peak deciding to cut their losses and close down all Vectrix's US facilities at the end of last year. The first bespoke custom motorcycle company to achieve Euro 4 compliance The engine featured in the new 'Viking' Concept was unveiled late last year and is the first air-cooled V-twin to meet the new Euro 4 emissions requirements. A lot more stringent than the Euro 3 norms they replace (effective January 1st 2016), and subject a six stage testing procedure that is 50 percent longer than the protocol it replaces, Lauge Jensen say the engine is "mean, lean and green" and the only custom motorcycle manufacturer in the world to have global type approval. Established in 2008 by Uffe Lauge Jensen at Horsens, Denmark, and bought last year by Anders Kirk Johansen, the company specializes in bespoke custom motorcycles, The Lauge Jensen/S&S 11 but sees this new engine and the 'Viking' inch fuel injected engine Concept as a possible platform for volume meets the upcoming Euro 4 emissions controls production. Uffe Lauge Jensen, who is still central to the project as Director of Development, says that his team "designed its own catalytic converter exhaust system which we calibrated specifically to the cat/chassis set-up. “Being first with EURO 4 may not be a primary concern for some of our customers, but it will give them the reassurance that they own a fantastic and personal motorcycle, which is future-proofed, and ahead of the rest in its low emission output.” The fuel injected S&S 45 degree 111 inch V-twin was co-developed by Lauge Jensen and S&S Cycle in terms of emissions testing and tuning, both at S&S’ own facility at Viola, Wisconsin, and at TÜV Automotive in Pfungstadt, Germany. To pass the Euro 4 test the motorcycle used must have been running for at least 1,000km to give a fair reading (the efficiency of catalytic converters declines with use), and the bikes are placed on a rolling road to simulate various riding situations and engine behavior. The EURO 4 test lasts for 1,800 seconds and is completed six times, compared to EURO 3, which tests the vehicle for 1,200 seconds three times. Because of the importance of the exhaust system and the catalytic converters, S&S says they were "uniquely positioned to support our customer and help develop a package that is not only efficient and clean, but retains the character and sound that riders want from an air-cooled v-twin." The company says it intends "to build a bike based on the 'Viking' Concept at higher volumes and with a lower price tag than the 'Great Dane'." HHI's brand new Okuma CNC milling center - 39,000 lbs of production capacity ready to go! both the low and mid range. RIDE Wright Wheels, well known for their extensive range of spoked motorcycle wheels, have been building a reputation for also now manufacturing forged billet wheels, and have taken that technology to create their new threepiece modular billet hub for their wheels. Ride Wright states that it is the first company to offer the new design of 6061-T6 aluminum hubs and that it will be offering them on its entire range, including the new forged line. With the new hub design dealers need to carry less stock, as one wheel can be used for different applications with a simple change of hub ends. THIS year Ikon’s 76 series shock range has undergone a major expansion with the introduction of Ikon Basix. "For the budget conscious rider, dyno tested rear suspension has never before been an option for newer model bikes," says Managing Director Geoff Lowe. Featuring chrome plated bodies, fixed rate damping, 3-position adjustable pre-load and a black powder coated narrow series progressive rate spring, Lowe says that "Ikon Basix provide a level of value and performance in the budget market not seen in years. While better performance is available from our adjustable shock absorber range, 'Basix' incorporate the same high level of quality and testing that the adjustables enjoy". Frankenstein triple trees FRANKENSTEIN Trikes originally designed their triple trees for use on Harley-Davidson Heritage and Touring models that have been converted to trikes, using the company’s kits. Now, with the increased use of larger front wheels on these bikes, the same triple trees can be used to correct the geometry created by "big fronts". Frankenstein say that when their raked triple trees are used with stock fork tubes and a 21in wheel, the correct trail can be retained. Gas caps and shocks from Zodiac ZODIAC now has locking gas caps available that feature a 3D skull logo. The caps, which are available for Sportster, Big Twin and Twin Cam models, feature a chrome and black finish with the lock hidden by the skull. The caps feature a knurled perimeter to ease opening and closing. Vented gas caps fit on Sportsters as well as on the left gas tank bung on most Big Twin and Twin Cam models. Non-vented gas caps fit on the right gas tank bung on most Big Twin and Twin Cam models, but cannot be used to replace the fuel gauge. 300mm floating rotors MÜLLER Motorcycles in Germany, known for their six-piston brake for Harley models, have added to their product range with new 300mm brake discs. The floating brake discs are said to improve brake performance considerably. Advantages of the brake discs are a fully controllable brake pressure as well as an even wear of the brake pads. Due to improved heat dissipation and the floating bearing, distortion of the brake discs is nearly impossible even under the highest demands. The discs are TÜV approved and available in 292mm (11.5in) and 300mm and can be combined with the stock brake caliper, and the Müller six-piston brake or aftermarket brakes. They are available in matt black, satin black or polished black. Also now available through Zodiac are the Series 970 rear shocks from Progressive Suspension. These shocks combine a high pressure gas monotube design with deflective disc damping routed through two unique circuits, and feature adjustment for compression damping via an easily accessible knob. The forged aluminum shock body and piggyback are internally coated to reduce friction. Progressive rate springs are fitted with pre-load adjusters and hard chrome main shafts are used. Available in black with magnesium-look or black upper and lower eyes, the Series 970 shocks are available for most Dyna, Sportster and XR 1200 models. W&W Cycles continues to cater to the needs of owners of older Harley models and is now carrying Amal mk1 concentric carburetors for use on those bikes. Originally introduced in 1966, the mk1 was a replacement for the Amal Monobloc, and as such is smaller and lighter, has a completely concentric design, and the air and idle adjusters are relocated for easy access. The reproduction carburetors available through W&W feature various improvements over the originals including a forged alloy, hard anodized throttle slide, which has a low friction surface for smoother operation and greater wear resistance. The material used for the carburetor body has a passivated finish to resist corrosion, and the ethanol-resistant, punctureproof Stayup float and Viton tipped alloy needle valve are said to help improve control of the fuel flow. Two versions of the reproduction Amal mk1 are available; one to fit 750cc engines and the other for 1,000 and 1,200cc models. To allow the Amal carbs to be used on Linkert inlet manifolds, W&W is stocking Bates adaptors. One option is a three-bolt design for side valve and ‘36-‘39 OHV engines, while the other, a four-bolt version, works with OHV engines ‘40-‘65, K-Model ‘52-‘56, and WR applications. The Bates parts selection at W&W includes the company’s adaptors to fit OEM or aftermarket oval air cleaners with recessed backing plate to S&S Super E and G carbs. Made in Germany from aluminum, the adaptors have a satin finish and require three 1/4in20 x 3/8in Allen screws to mount them. The design of the Moon taillight, now stocked at W&W, is derived from ‘33-’36 Ford car lights. This version has a metal housing with two holes at the back for universal mounting. The light assembly includes a stop light and license plate illumination, but not a license bracket. Under its Cannonball brand, W&W is manufacturing fender mounts for Springer forks with 19in or 21in wheels. Bolt hole distance on the brackets is 65mm, with a maximum fender width of 120mm, and stock FXSTS fenders are bolt-on fit. The brackets can be ordered in black or silver anodized finishes and to fit 24mm OEM forks or 25mm W&W forks. Completing the latest new selection of Old School parts at W&W are the Performance Machine Vintage four-piston brake calipers. The caliper utilizes the look of one of the company’s original ‘Dual Action Cast’ caliper designs, but has fourpiston internals. Available for front or rear use, the calipers can be ordered in Black Ops, chrome or Machined Ops finishes. Superchips tuners for Android and iOS devices SUPERCHIPS continues to update its range of electronic tuning aids - recent additions include the Vigilante EZ hand-held tuner and Vigilante Flash mobile tuner and performance meter for fuelinjected Harley-Davidsons. Superchips say that "EZ and Flash are ideal for those riders who want to tune their bike’s fuel injection system on a stock or Stage 1 modified Harley model where a performance air cleaner and/or performance exhaust has been installed. "Vigilante EZ or Flash are designed to deliver calibrations tailored to the bike’s exhaust and intake configuration, eliminating decelerationpop, reducing running temperatures, and improving acceleration and response by reprogramming the stock electronic control module after downloading a tune-file from the device." Said to be easy to install, the EZ tuner’s connector is plugged into the Data Bus of the bike with the style of intake or exhaust selected via the unit's toggle switches. "The bike is tuned in just two minutes and EZ saves the stock files, allowing users to return to stock at any time". Diagnostic Trouble Codes (DTCs) are said to be easily read and cleared. Vigilante Flash is described as having all the features of EZ, but with the added ability to "monitor performance parameters on a mobile Android or iOS device. Apart from the Vigilante Flash device, all that is needed is an iPhone, iPad, Android phone or Android tablet. "The Flash connects wirelessly via a Bluetooth dongle (MVI) to the motorcycle and allows users to monitor the motorcycle and its performance by displaying virtual gauges in various configurations, user-configurable parameter displays and data logging (also known as data acquisition/ DAQ). Display options include speed in mph or kph, rpm, which gear the bike is in, 0-60mph and 1⁄4-mile times." The company says that two versions of the Vigilante EZ and Flash are available. One for all models with J-1850 Data Bus system, such as ‘04 – ‘13 Sportster, ‘01 – ’11 Softail, ‘02 - ‘13 Touring, ‘02 to present V-Rod and ‘04 – ‘12 Dyna; with another for all models with CAN Bus system, such as ‘12 to present Softail, ‘13 to present Dyna, ‘14 to present Sportster and ‘14 to present Touring models. The Superchips range is available through distributors, including Tucker Rocky and Zodiac International in Europe. AMONG the latest new lines from Drag Specialties are black rocker boxes. Made of die-cast aluminum, supplied complete with gaskets, and finished in satin black powder coat, the rocker boxes are sold individually to fit ‘92-‘99 Evo Big Twin models. The front brake master cylinder assemblies from Drag Specialties include the lever, clamp half and banjo bolt. The 9⁄16in bore master cylinders have a 7⁄16in-24 banjo bolt, and the 11⁄16in bore master cylinders have a 3⁄8in-24 banjo bolt. that may bounce around in the bags. Available in black and pre-cut to size, the kit is treated for mildew and moisture resistance, and the material has a pressure-sensitive adhesive on the back for an easy peal and stick application. Installation in ‘14 FLHT, FLHX and FLHR models creates a lined lid, sides and bottom. A second option for use with 2014 Touring model saddlebags is Drag Specialties collapsible soft luggage. The bags are designed to fit the 2014 hard saddlebags from the larger storage compartment to the multi-angled lid, and feature top storage compartments with zipper closures. The zipper on the outer compartments wraps around two sides in the rear and three sides in the front for easy access. The zipper on the main compartment wraps around three sides and the lid will flip-up, creating an open access for easy loading and locating items. Each bag has two handles that can be joined together with a leather-like pad for easy transporting before and after loading. finish, with optional quiet baffle. Described as "addressing the need for a slip-on system for the Victory’s 106-ci V-twin motor" Vance & Hines say that "every aspect of the Hi-Output slip-on’s design is singularly focused to yield maximum horsepower by improving the volumetric efficiency of both stock and heavily modified engines." Also seen here are Turn Down slip-ons for the 2014 Indian Chieftain (not for the Classic or Vintage) that are said to "perfectly complement the luxuriously sculpted lines of the Chieftain and provide a sumptuous exhaust note to the powerful 111 cubic inch Thunder Stroke V-twin." is to offer riders and dealers access to the most comprehensive line-up of aftermarket accessories for Victory models in the marketplace. “However, the product line is only part of the story. In a time when customer service appears to have gone by the wayside, from the very beginning we have worked hard to ensure that great service is the company’s greatest asset – and I strongly believe that ours is the best in the Victory market.” The company has an easy-to-navigate website, which is updated regularly and includes “how-to” videos and customization showcases. The company sells through a large dealer network and ships domestically and internationally daily with a 98 percent fill rate. “Our main warehouse is based here at Warren, Ohio, but uniquely for a business for our size and age we also have a warehouse in Germany to better serve European customers. “I think our dealer program is excellent with a buy-in as low as $500 and margins of around 30 percent or more on our top 25 SKUs. “Dealers who want to get into selling Victory custom and aftermarket parts now have one place to order from, allowing them to be more profitable in an area that they may have struggled with before.” Witchdoctor’s offers a free drop shipping service for dealers who need that option. FLT raked triple trees THESE new 7 degree "KO" trees and kits for 2014 FLTs from Ness are made from forged 6061-T6 billet aluminum and allow the stock trail numbers to be retained while using large diameter wheels. Ness say that these are "the best handling kits for touring models on the market", and that they allow 7 degrees of rake while maintaining 7 degrees of trail when using 23" wheels, without frame modifications. Designed for 21" and 23" wheels (6 1/8" rake on 21 inchers), 'Batwing' style fairings retain their stock position, and the kit includes top and bottom tree, pressed-in steel stem, lower fork bearing and travel limiters. They fit 1997-2013 models, and 2014-up models with 49mm forks. Ignition conversions and Ultra-light pulleys weight of the OEM part they replace. The reduced weight of the pulleys equates to reclaimed horsepower and less wear on the bearings. BDL’s lightweight transmission pulleys are currently available for four-speed Big Twins ‘79 – ‘83, fivespeed ‘86 to present and five-speed Sportsters ‘92 onwards. Vance & Hines Fuelpak FP3 THE latest evolution of Vance & Hines’ Fuelpak, the FP3, has been designed to work on the new Harley-Davidson models that operate the HDLAN (CAN Bus) system. Vance & Hines FP3 connects remotely via Bluetooth to iPhone or Android smartphones, Fuelpak FP3 and then uses Flash technology to recalibrate the engine’s parameters and mapping to exhaust system and other performance upgrades downloaded from the expansive library of calibrations developed by Vance & Hines. It is also possible for users to adjust or modify any of the tables of the FP3’s tuning, such as ignition, rev limit and more. Autotune is a feature included on the Fuelpak FP3 that makes use of the factory sensors to increase the efficiency of tuning for specific requirements; whether tuning for unique components or different grades of fuel. This feature is in addition to the fact that once the Fuelpak FP3 is plugged-in live sensor data can be viewed on a smartphone display, which includes speed, rpm, cylinder head temperature, voltage, gear selection and other information. Other information displayed on smartphones connected to the Fuelpak FP3 includes ‘Trouble Codes’, and the FP3 can be used to clear them too. PAUGHCO, already well known for its extensive range of frames, also offers a wide selection of smaller parts including billet aluminum Panhead rocker boxes. Features on the billet boxes include increased wall and lip thickness and matching Paughco socket head cap screws and counter sunk retaining holes. Finished in chrome, the rocker boxes fit ‘48-‘65 Panhead engines and replicas with OEM mounting surface and bolt dimensions. FIGURE Machine is continuing to expand its product range with the introduction of new handlebar options. The company’s Billet Bars line of handlebars has been created with what the business describes as a “distinct industrial style that stands out in a crowd”. Manufactured from a combination of steel tubing and aluminum, the bars are powder coated for a durable finish. The 1in diameter Billet Bar, which is offered in three styles (‘Z’, ’V’ or ‘U’) as well as a range of lengths and widths, is designed to accept stock controls, and the knurled base will work with all 1in risers. The new product range from Figure Machine continues with the launch of its Flow-Stack velocity stacks. They feature a 2in tall stack mounted to an internally breathing backing plate. The Flow-Stack is supplied with an optional stainless steel mesh screen that can be installed to keep small debris out of your engine. The velocity stacks are available in a choice of Vivid Black, Black Denim or Blonde Silver, and all have the signature ‘Figure Machine USA’ engraving around the base of the stack. JIMS range of professional tools for Harley-Davidson mechanics has recently been expanded with the introduction of an ignition switch housing alignment tool for use on 2014 FL Touring models. JIMS says that with the tool correct alignment of the ignition switch cover is quickly and easily achieved. The design of this version of the tool, specifically for use on 2014 models, is based on its proven design for earlier models. NOW available from Thunderbike in Germany are street legal TB designed air filters together with Jekill and Hyde exhaust systems, and the electronically adjustable Jekill and Hyde exhaust systems are designed to be used with these aluminum air filters. The 3D machined air filters have a long-life K&N air filter insert. Mapping with a fuel controller is recommended to ensure best performance from the motor after fitting the parts. Air filters are available in different designs and colors and TÜV approved. world leader in ‘metric’ performance exhausts and has nearly three decades of championship wins in the locker. Features of the Comp-S include swept-up muffler for enhanced ground clearance, a carbon fiber end cap and optimized fit for forward and mid controls. Made in the USA, the Comp-S accepts the stock O2 sensor and with “each weld on this mandrel bent stainless steel system hand-crafted to perfection”, the fully TIG welded high-temp packed Comp-S is available in brush finish or ceramic black. TÜV approved, handlebars for 2014 Touring models. Available in 350mm, 400mm and 450mm heights, the new handlebars can be used with the stock riser covers as short risers fit the stock mounting position, and stock or aftermarket controls can be used, while despite the slim look and 90-degree angles, cables and hydraulic lines can be hidden inside the bars. Moving towards the rear of the bike, Rick’s offers extended side covers for more aerodynamic airflow around the bags. The company’s side fillers are manufactured from heavy duty fiberglass and are a bolt-on replacement for the stock pieces. They work with Rick’s own custom bags, stock and CVO bags. Completing the new selection of parts developed by Rick’s for the 2014 Touring models is the company’s tail end kit. The newly developed package includes a rear fender with a 4in downward extension and 1.5in rearward stretch, and cut-outs allow the mounting of H-D CVO taillights in the glass fiber fender. The Rick’s 2014 model year extended Touring cases feature the same dimensions as the new fender, and yet can be used with the stock H-D covers, keys and latches, as well as aftermarket options. IN the Modified Harley class at the 2013 World Championship of Custom Bike Building there was a strong representation of retro styled builds, and the most successful build of that style was ‘La Salle’, from One Way Machine in Germany. The build was good enough to take second place in the class and has since gone on to pick up numerous trophies at custom shows around Europe NE Way Machine is the name of the custom shop run by Julian von Oheimb in Staufenberg, Germany, and it was one of his builds – La Salle – that took second place in the Modified Harley class at the 2013 World Championship of Custom Bike Building. Julian’s plan when he began the build of La Salle was to try and create a bike that looked old but featured modern running gear, and to achieve this he began by rolling a ’94 Softail into his shop, complete with EVO motor. Given that Softail frames already mimic the look of older rigid frames, and the restrictions on frame modifications within the class, the base frame was left basically stock. and MMI graduate who has worked in many facets of the industry - first at a local motorcycle shop on the Monterey Peninsula, California, and he then spent 4 years as a designer at Corbin Saddles, and joined Custom Chrome in 1999 as a member of the Research and Development department. so could void the manufacturer's warranty, in addition to causing damage to the vehicle. The AMA applauded the EPA's decision in its proposed rule to roll back the requirement for wider distribution and use of E15 under its Renewable Fuel Standard. Earlier this year the EPA announced that it was adopting E10 (10 percent ethanol content) as its standard test fuel, effective 2017, resisting pressure to back the higher content E15.